Yes Twitter followers, I woke up this morning at 7am and did something just a few minutes ago that I honestly haven't done in years. I picked up the Bible and read the book of James. Alone in the house with a cup of coffee I took a few minutes and read through James. I don't know if I've even ever read James, but I do feel refreshed after reading. I've got the link to the book of James below for anyone that has some time to read. Enjoy. Let me know your progress as well. Peace! Link: BibleGateway.com: Search for a Bible passage in over 35 languages and 50 versions..
$25 Million for a Bible? 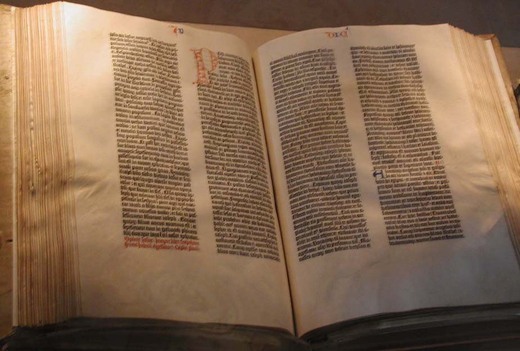 Back in 1456 the Gutenberg Bible (pictured above) was the first book ever printed. Then about 180 copies were produced and today it is believed that there are 11 complete copies and four in perfect condition. Experts say that the a complete book would run between $25-$35 million! A single page would get ya around $25,000. Couldn't the $25,000,000 go to a greater cause? We as people are crazy! Link: Rarest of the rare - BOOKS- msnbc.com. I went and saw Joel Osteen at the Amway Arena here in Orlando last night. Joel's story and messages will enrich your life. If you haven't seen him preach in person, you need to put it on your things to do/see before you leave this big round marble. Link: Joel Osteen Ministries: Joel Osteen Ministries. Yesterday a man stood up and gave one of the best prayers...gentle, yet powerful. Think of something that you love to do and most likely there is someone you look up to that does the same thing...very well. For me, growing up playing basketball, it was Michael Jordan. No surprise there, as many a ball player would answer the same. I would try and emulate everything he did on the court to the best of my ability. From the talcum powder before the game (I'd use baby powder on my home court when I was a kid), to the shoes, to the long shorts, the first pump, the fade away (kinda) and on and on. He was the best and who wouldn't want to be the best. As I get older (30 in May) I can see a day when I pay big money to go to his adult fantasy camp in Vegas (35 is the minimum age). I can see myself playing with him and against him one on one. What I can't see is me shouting at him. I can't see it. MJ is a man just like me, but because he mastered the sport which I love I give him much respect. I would feel privileged just to be in his presence on the court. Just to learn. I wouldn't shout. I'd listen. Then I'd listen some more. I'd take in everything I could in the short amount of time I would have with him. It would be a blessing, a dream come true. I'd play with passion, but I wouldn't shout. I'd give my all, but never shout. I'd show respect and simply be thankful. It makes sense doesn't it. Maybe hoops isn't your thing, but think of something you love and I'm sure the same would apply. Why is it different in Church? Weekly I stand, at the same time each week, and listen to someone from the Church pray. Weekly it sounds about the same. Someone gets up and begins to pray with a ton of passion. Passion is great. Passion moves mountains. Passion doesn't equate to shouting or giving commands though. At least not to me. We are such followers that we learn to "pray" by listening to how others pray. This is no different than any other thing in life. We forget what prayer is all about and it becomes a show. We must sound as good as the next. The best prayers are new Christians because they don't know "how to pray" yet. It's just heart, love and passion. Mercy Me wrote a song called I Can Only Imagine a few years back and it says, "Surrounded by Your glory, what will my heart feel. Will I dance for you Jesus or in awe of you be still. Will I stand in your presence or to my knees will I fall. Will I sing hallelujah, will I be able to speak at all. I can only imagine." I feel if during any one of those prayers if Jesus himself walked through the doors the tone would change. I'm about 1000% sure that I wouldn't be able to speak. I doubt it would be about the show then. My point is that if we wouldn't shout to someone who is no different than us, merely excellent at what they do, why would we shout to/at God? When someone is rich people treat them differently, but all the person who is wealthy ever really wants is to be treated like anyone else. My feelings are the same about God. He doesn't need the show. He KNOWS us. Why can't we just talk, pray, be in His presence like anyone else? If you were close to the rich man or woman you wouldn't treat them differently. I'm writing all of this and I'm far from where I'll be one day. This isn't meant to be judgement, merely recognition of the traps we all fall into. I mean if there is a show to see, Church couldn't be a better place...but why any show at all? "If the Church is alive, it's worth the drive." That was a line I heard from a lady I worked with when I first began going to church. I used that combination of words, the catchy phrase, as my explanation when people would ask why I would drive 45-minutes to go to church when there are churches all around me. The truth is it was the only church I had been to, and I liked it. Simple really. Life however isn't quite that simple at least we as the instruments in life tend to make it not so simple. So I made church like everything else difficult. I chose to stop going to the church that inspired me to drive there two sometimes three times a week. I told myself a closer church home would be more productive and so I left. I made a new home and though it wasn't the same, I did enjoy it. I tried to make my own mark...my own decision. I was introduced to the last church by my girlfriend at the time and this church I had chosen myself. I was a man or so I thought. I attended every week for almost two years. The relationship with the girl ended and six months later my time with my chosen church did too. I was in a funk, doubting everything. I came out of it and began attending another church. Not regularly though. The passion to attend honestly wasn't there anymore. It felt like a routine and it isn't in my nature to do anything just to be doing it. I'm extremely passionate about things that I enjoy. Almost to a fault sometimes. No matter how hard I tried to motivate myself I just couldn't get into it. A few weeks ago I went back home. For the first time in a long time I'm looking forward to Sunday's and wishing they still had the Wednesday service. A few years ago I thought I was being man by making a decision to be closer to home, when in reality I was just a boy. It takes wisdom and courage to identify and recognize when you have something great. Sometimes you just have to experience other things to truly understand what it is you really have. This post is really nothing more than me saying that the feeling of home in anything really is one of the greatest feelings you can ever experience. Having found that home so early in the church was a blessing that I had no idea I had been given. Now I will thankfully take that blessing back and enjoy it to its fullest. I just read an interview (The Monster Within) of Dan Haseltine, the frontman of Jars of Clay that blew me away. The Jars new album Good Monsters just came out and through Hasletine's interview he reveals that even he has faced many monsters in his 13 year career. Below is an excerpt...please read the entire interview. We are all trying to understand the struggle. "Anything in particular prompt your desire to explore this? Haseltine: I had recently encountered this thing called the Samson Society. It's a group of guys who get together and get a lot of stuff off their chests, the kinds of things that make us think that if somebody knew this about us, they would run the other way. What I found is that guys are sharing this kind of stuff, and it's making people love them more. That's a vulnerable place. The gospel never calls us to live our lives privately, but the idea of individualism and isolation has worked itself into our idea of what a good Christian life looks like—that it's full of quiet times where it's just us and God. But for me, when I get into that scenario, the only voice I'm really hearing is my own. And when I'm trying to wrestle with some truth of the gospel or some new element God is trying to teach me, it's just me using my own knowledge base rather than living that out in community with other people. So it never really works. The kind of maturity that I hope for, the kinds of things I want to have freedom from, they never come, because it's just me working it out by myself.